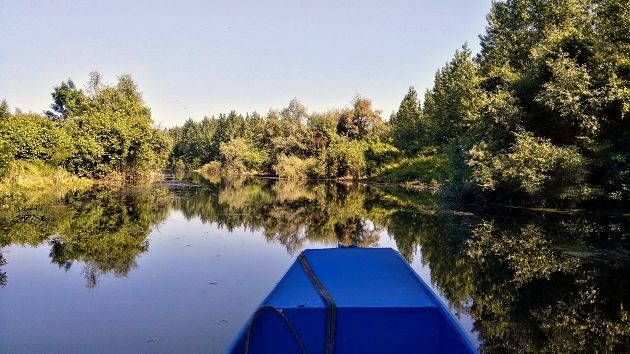 Beljarica backwaters cover the 900 ha of wilderness on the eastern bank of the Danube, between the river and the embankment, by the suburb of Kovilovo, some 15 kilometres upstream from downtown Belgrade. I have been there several times last month, but barely ever managed to do any proper birding! Mostly, I was showing the area to journalists and talking to cameras. More about that later, but first, what have I found there? Despite mostly guiding them, I still somehow managed to see a European Badger sitting and watching me back for several seconds, before it slipped into bushes and quite a few White-tailed Eagles, e.g. four in just one morning. That is hardly a surprise: this area holds 3 to 4 breeding pairs of White-tailed Eagles, which represents the biggest density per square mile anywhere in the country! Then, there were Eurasian Otters, which I’ve seen twice. The first time I spotted some movement on the water, focused my binos to see a Common Moorhen, but, hey, there’s something deep behind it, focusing further and seeing two otters diving and surfacing, swirling and playing. The second time, there’s a movement in the far end of one “cubicle”, something is walking out of the water… The introduced Coypu (or Nutria) comes to mind first, but no, this is slimmer, more elongated, with a sharper head – an otter! This was my first time to observe it out of the water, walking along a fallen willow trunk towards a Black-crowned Night Heron which, more confused than scared, took flight. The other good birds were a Black Stork, several times, feeding among herons and egrets or soaring, and one uncommon Lesser Grey Shrike, only my fifth observation this year – and I consider this to be a good year, alongside with more common Red-backed Shrikes. So, the Belgrade press become acutely interested in birding? I wish, but no, that wasn’t the case. Beljarica, which is nicknamed the Belgrade Amazon, is destined to be clear-cut, drained, filled up and covered by concrete, to become the new and hugely oversized city harbor. And how about Black Storks, otters and eagles? Perhaps they will be dug up from crumbling concrete by some future paleontologists, but nowadays, the Belgrade authorities wish them no good. While I am talking to the media of the home of the otter and the house of the eagle, the authorities talk of millions in foreign investments. Investments?!? Not really, in the real world it is called a credit with unfavourable interest rate, to be paid off by the tax payers. At the same time, the European Union offers more favourable interest rates, but for its money, insists that European environmental standards are observed and implemented. And destroying the largest portion of the Danube backwaters remaining around Belgrade, part of the international ecological corridor and the “Confluence of the Sava and the Danube Rivers” Important Bird Area (IBA) – already proposed for a nature reserve by the Government’s Institute for the Protection of Nature of Serbia, doesn’t fit under EU standards. While Serbia claims to strive towards the EU membership, it is back to the Chinese credit and Chinese environmental standards. Annex II of the Bern Convention lists 45 of Beljarica’s bird species, with a further 91 species in Annex III. The Convention on Migratory Species (the Bonn Convention) lists two of these species – the Ferruginous Duck and the White-tailed Eagle – in Annex I, with a further 64 species in the Annex II. Finally, 24 species in Annex I of the EU Bird Directive were recorded in this area. Is this of any importance to an aspiring EU member country? Or is it the EU membership that is of no importance? Afraid that, against millions in investments wildlife may not be an argument enough, I reached for another – the wellbeing of Belgraders, further downstream. In early 20th century, Beljarica wasn’t a biodiversity island like today, but an integral part of a 400 square kilometres of floodplain of Pancevacki rit area, north of Belgrade. Then, between 1929 and 1933, 89 kilometres of embankments were built all around it, cutting it off from the rhythms of seasonal flooding and opening it to agriculture and settlement. Yet, the Beljarica remained open to flooding. Why? Were the hydrologists of 1920s worried where the fish will spawn, Wild Boars fatten and eagles nest? Well, it could be that, too, but I think that they were more focused on their primary job, the control of the floods. And there is only one certain way to protect the lower parts of the city from floods: let the river spread and flood some other area, before it reaches the city. The Beljarica is the very buoyancy aid of Belgrade. Cover it in concrete and you are making the flood wave higher, faster and stronger. Especially threatened areas of the city are the banks of New Belgrade and the right bank of the Sava, where the controversial Belgrade Waterfront project is taking shape. To add but one more piece of the puzzle, Beljarica is similar in size to New Belgrade. 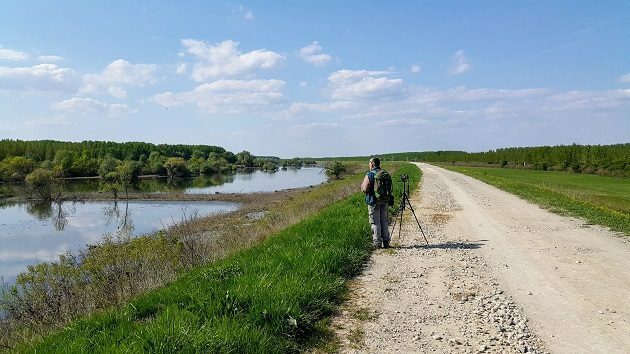 The League for Ornithological Action (LOA), a local NGO which is mostly focused on the “Confluence of the Sava and the Danube Rivers”, sees itself as a caretaker of that IBA. In the last few years, its members have eBirded 205 bird species within the IBA borders, 136 of them within Beljarica and 108 of those strictly protected under Serbian legislation. 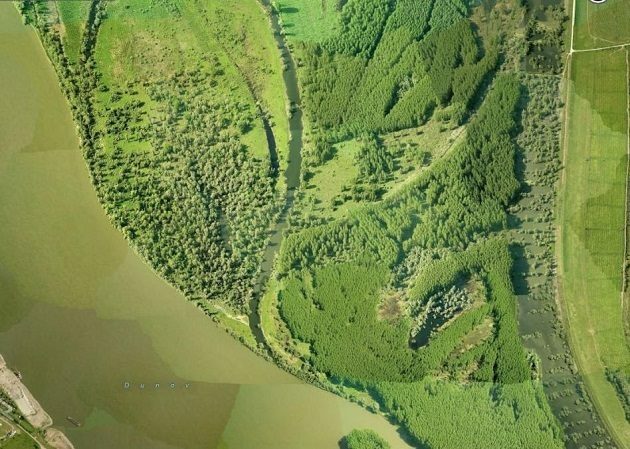 Worried for the future of Beljarica, LOA launched the Save the Belgrade Amazon campaign, with a video clip that had 310,000 views and 7,100 shares in two weeks and a local online petition which reached 7,300 signatures in the first fortnight. In the same time, there were about 15 articles in printed media and internet portals, two blogs and three TV features and LOA’s Facebook page has doubled its membership, while the page likes have skyrocketed by 21,000 per cent! That clearly shows that people (or should I say voters) do value their environment and were merely waiting for a chance to show that, for a way to express their concern. Disregarding it, on 29th of June, the Belgrade City Assembly adopted the new Strategy of Development of Belgrade 2017-2021 which officially places the future harbour at the cost of Beljarica and calls for the change of the General Spatial Plan. But, at this time, the Belgrade Amazon still stands. And, with it, its otters, eagles and storks. Because the house of the eagle literally protects the homes of Belgraders, they are more than worth fighting for. Thanks for giving us some insights on an important conservation battle that we in the U.S. know little about. I’m glad the people of Belgrade and the surrounding area have woken up. Maybe there’s still time to stop this travesty. Thank you, Donna. Hopefully, it’s not too late. It seems that this time we might have been timely proactive, as opposed to usual reactive. Time and tide wait for no man or woman!